Adpol supplies a wide range of UK manufactured Silicone Sponge Extrusions to meet numerous applications and specific customer requirements. Our Silicone Sponge Extrusions are available in a range of colours and densities from very soft (10lb/ft) to very dense (33lb/ft) and can even be custom blended to meet a specific requirement. 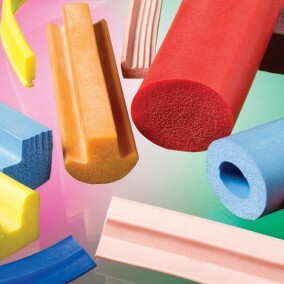 As well as tubing and cord we can supply Silicone Sponge Extrusions in a range of profiles & colours, a small selection of which are shown on this page. These can be provided as cut lengths , coils or joined into O Ring or picture frame gaskets and adhesive backed if required. Food grade and metal loaded silicone sponge extrusions are also available. Silicone Sponge Extrusions offer all the excellent properties of Silicone Rubber, excellent shape memory, UV & Oxidisation resistance, moisture resistance and wide temperature range (-50 – +200°C) plus the ability to curve round bends without creasing and cope with a much wider variation in sealing gaps to be filled. For a quotation or advice on Silicone Sponge Extrusions please contact our sales team. We can normally provide quotations within 24 – 48hrs with a drawing or sample to work off.